Um(peleya) Marsema Balinton was born in 1935, in Brooklyn, New York. Her mother was a concert pianist but her father had no musical ability. Aged four, her family moved to San Francisco where she grew up. Peliya enjoyed dancing and singing and became friends with Jamesetta Hawkins, a member of a girl gang called the Lucky 20's. Hawkins was a wild girl and ended up in prison bit on her release she formed a singing group with one of Peliya's younger sisters. Jamesetta Hawkins was soon discovered by bandleader Johnny Otis and re-christened Etta James. Peliya was determined to become a singer and took every opportunity to enter local talent contests in San Francisco. She became so successful she was told her to stop entering. She was spotted by Johnny Otis in L.A., and offered a record contract in 1954. Peliya became Little Miss Sugar Pie, and toured with the Johnny Otis Revue. The popular live performer was less successful with her early recordings, often with her husband Pee Wee Kingsley. Then in 1959. "I Want to Know" was recorded and produced by Bob Geddins, Sr. It was released on an Oakland-based label, Checker, and rose to Number 3 on the Billboard's Hot R&B chart. She made more than 20 appearances at the Apollo Theatre and appeared regularly at The Regal in Chicago and The Howard in Washington, DC. 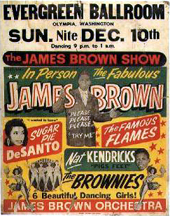 It was at the Apollo where she was spotted by James Brown, and became his dynamic opening act for the next two years. Between 1959 and 1960, the tiny funky diva bedazzled audiences with her saucy stage presence and released her first album in 1961. A year later she was singing with the Nat Hendrix Band. After her marriage ended DeSanto moved to Chicago and signed as singer and writer with Chess Records in 1962. She would become the most prolific and highest paid songwriter for the label. "Slip-In Mules (No High Heel Sneakers)" (1964) was an answer song to Tommy Tucker’s “High Heeled Sneekers“ (1964) and described how sneakers hurt her feet. The answer song (or response song) started in the 30s and became common practice in the 50s and 60s. It referred to piggy backing on the success of a previous recording usually by another artist. Most often these took the form of the female response to an original hit by a male artist, and it was not uncommon, depending on the success of the original hit, to have several answer records by different artists. At times the answer record imitated the original so closely it led to legal proceedings following alleged copyright infringement. Most response songs were instantly forgettable but very occasionally the answer record outsold the original hit. A good example was Mannish Boy (1955) by Muddy Waters. This was response to Bo Diddley's "I'm a Man", which also happened to be a response to "I'm Your Hoochie Coochie Man", an earlier song by Muddy Waters in 1954. 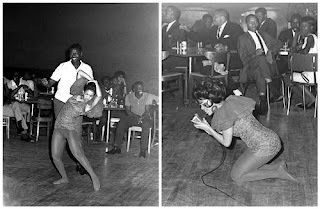 "Use What You Got" /"Soulful Dress" (1964) established her persona as an assertive young woman who took no mess. She may have been small in stature but she was a giant on stage. Sugar Pie DeSanto joined the American Folk Blues Festival that toured Europe in 1964. She was the only female artist that was billed as “the best Blues Artists of America." Her wild stage performances with standing back flips included had mass appeal and set the bar for what would come a decade later on the dance floor with Northern Soul. The other headliners included Willie Dixon, John Henry Barbee, Sleepy John Estes, Clifton James, Sunnyland Slim, Hubert Sumlin, Lightnin Hopkins, and the legendary Sonny Boy Williamson. In 1965, under the name Peylia Parham, she began writing in collaboration with Shena DeMell. They produced the song "Do I Make Myself Clear", which DeSanto sang as a duet with Etta James and it reached the top 10. They followed this up with, "In the Basement", which evoked the early years when James ran with the Lucky 20's. The song did not however have the same appeal as its predecessor. Sugar Pie DeSanto went back to writing more with Shena DeMell, but when Go Go Power (1966), failed to chart she left Chess. Sugar Pie DeSanto kept on writing songs and recorded for a few more labels without much success and eventually moved back to the Bay Area, settling in Oakland. She will be forever remembered for her stage performances which far surpassed her studio recordings, and a full-length live recording, Classic Sugar Pie, was recorded in New Orleans with arrangements by Wardell Quezergue. This was not released until 1997. In September 2008 (aged, 75) , she was given a Pioneer Award by the Rhythm and Blues Foundation and kicked off her shoes to do a back flip during her perfomance. She went on to perform to capacity crowds at Yoshi's Jazz & Supper Club, The Chicago Blues Festival, and the Poretta Soul Festival in Poretta, Italy.